The oral healthcare field is in a state of constant evolution, and Dr. Kirlough enjoys staying right at the forefront of these important developments here in Middleburg Heights. That’s why our dental office features several modern tools and technologies that help make your care experience even better in so many ways, from faster treatments to improved comfort to exceptional clinical accuracy. Our team will be happy to explain these benefits in greater detail during a first appointment! Contact Kirlough Family Dentistry today to get started. Intraoral cameras provide invaluable educational opportunities for patients throughout the treatment process. 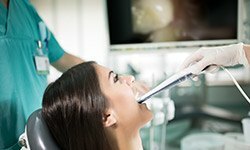 Our team members will navigate a camera-tipped wand through your mouth, capturing highly detailed images of the teeth, gum tissue, and much more. 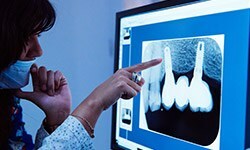 Then, one of our dentists can sit down with you and review the images, pointing out any concerning signs of damage and explaining possible treatment options with added clarity. We want you to always feel a full partner in this important process! Traditionally, X-rays were captured on film, slowly developed in darkrooms, and stored in bulky filing cabinets. Today, digital radiography has helped transform this essential diagnostic process for the better. Now, we can capture X-rays and make them available for viewing in seconds flat; transfers to insurance companies and other doctors are a breeze as well. Best of all, if you’re worried about radiation, don’t be – when compared with film, this exposure has been dramatically reduced by up to 90% for increased safety. 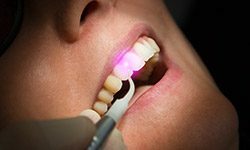 Lasers are quickly becoming the future of dentistry, and it’s not hard to understand why. These modern tools provide a precise, highly comfortable touch that exceeds traditional scalpels, especially when caring for the soft gum tissue. Dr. Kirlough uses the state-of-the-art PowerLase AT to provide aesthetic gum recontouring, treat the presence of periodontal (gum) disease, and more with only minimal post-operative symptoms – in fact, most patients don’t even need local anesthetic!